Shelf Life 12 months date of manufacture when in sealed pack and stored under proper condition. An acrylic polymer based economical elastomeric waterproofing system for protecting concrete & masonry surfaces. Area of Application Water proofing and repairs for cementitious substrate. Concrete structures like sunken portion, toilets, balcony, basement, chajjahs, terrace, concrete repairs, and water retaining structures. A tough, hard wearing, breathable waterproofing system for residential, industrial, housing and commercial buildings. Can be applied in the uniform thickness to horizontal and vertical surfaces. Excellent bond to most building materials. Dr.Fixit power creates should not be used in isolation of cement. Ensure to provide a protective plaster over the final coat to avoid mechanical damage. Modified mortars: All the repair mortar modified with dr. fixit power create shall be used for all renovation works in a concrete substrate. 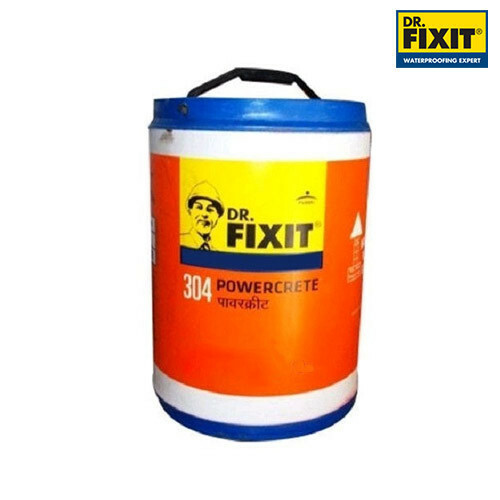 Add 10-15% of dr. fixit powercrete by weight of cement to the prepared mix of cement and sand mortar in a ratio of 1:3 and repair all the patchwork as per the suitability of the job.